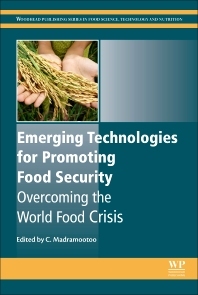 Emerging Technologies for Promoting Food Security: Overcoming the World Food Crisis discusses rising energy prices, increased biofuel use, water scarcity, and the rising world population, all factors that directly affect worldwide food security. The book examines the range of approaches to promoting global food security, including novel and existing agricultural and husbandry techniques for safe and sustainable food production. It is divided into three parts beginning with an overview of food security, an analysis of key drivers of food insecurity, and nutrition and food security. Part Two examines emerging technologies for plant and animal food security, with subsequent chapters discussing topics from genetic and aquaculture technologies, pest and disease control, environmental and policy issues affecting food security, and an in-depth analysis of water management and methods to reduce post-harvest losses. R&D personnel in agriculture and animal husbandry, food scientists with an interest in sustainability, those involved in policy-making and standard-setting and academics with research interests in the area of food security. Professor Chandra Madramootoo is Dean of the Faculty of Agricultural and Environmental Sciences, Associate Vice Principal of McGill University, a member of the senior academic leadership team of McGill University, and a James McGill Professor in the Department of Bioresource Engineering. He serves on several univesity governance bodies including Senate, Building and Properties Committee of the Board of Governors, and the Animal Resource Advisory Council.